Definition at line 48 of file time.h. Definition at line 387 of file time.h. Definition at line 75 of file time.h. Definition at line 293 of file time.h. Definition at line 435 of file time.h. Definition at line 89 of file time.h. Definition at line 70 of file time.h. Referenced by gmtime(), and mktime_worker(). Referenced by ATL::CTime::FormatGmt(), ATL::CTime::GetAsDBTIMESTAMP(), ATL::CTime::GetAsSystemTime(), and ATL::CTime::GetGmtTm(). Referenced by ATL::CTimeSpan::Format(), ATL::CTime::Format(), ATL::CTime::GetDay(), ATL::CTime::GetDayOfWeek(), ATL::CTime::GetHour(), ATL::CTime::GetLocalTm(), ATL::CTime::GetMinute(), ATL::CTime::GetMonth(), ATL::CTime::GetSecond(), ATL::CTime::GetYear(), and localtime_s(). Definition at line 429 of file time.h. Referenced by ATL::CTime::CTime(), and mktime(). Referenced by ATL::CTime::GetCurrentTime(), and time(). Definition at line 92 of file timezone.c. Referenced by _Strftime(), gettimeofday(), localtime(), and test__tzset(). Definition at line 393 of file time.h. Definition at line 394 of file time.h. Referenced by ConvertTimeString(), DaytimeHandler(), kbd_c(), kbd_h(), and Test_asctime(). Definition at line 23 of file clock.c. 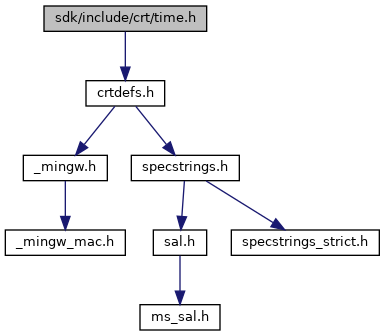 Referenced by BaseRendererImpl_SetSyncSource(), CKsClockForwarder_Constructor(), DMUSIC_CreateReferenceClockImpl(), get_time(), IDirectMusic8Impl_SetExternalMasterClock(), LIBXML_ATTR_FORMAT(), MediaStreamFilterImpl_GetSyncSource(), MediaStreamFilterImpl_SetSyncSource(), midi_IDirectMusicPort_GetLatencyClock(), QualityControlRender_SetClock(), startTimer(), SynthPortImpl_IDirectMusicPort_GetLatencyClock(), test_clock(), test_query_interface(), and test_wmreader_interfaces(). Definition at line 424 of file time.h. Definition at line 423 of file time.h. Definition at line 425 of file time.h. Referenced by convert_date_and_time(), getit(), GetUTCOffset(), GmTimeStr(), HTTP_HttpQueryInfoW(), iso9660_date(), iso9660_ldate(), localtime(), rdp_send_logon_info(), time_to_filetime(), and write_client_lease(). Definition at line 426 of file time.h. Referenced by _tctime(), add_special_defines(), CCabinet::ConvertDateAndTime(), DaytimeHandler(), DoOutput(), file_stat(), FormatDateTime(), get_fattime(), get_test_year(), GetStartSpoolDate(), init(), InitLsMonths(), iso9660_date(), iso9660_ldate(), logMess(), LsDate(), main(), NcFTPConfirmResumeDownloadProc(), NcFTPConfirmResumeUploadProc(), rdp_send_logon_info(), setup_tables(), ShowInfo(), SpoolName(), stime_arg1(), test_localtime(), test_mktime(), Trace(), UnDate(), UnLslR(), UnMDTMDate(), write_volume_label(), and xmlMemDisplay(). Definition at line 427 of file time.h. Definition at line 428 of file time.h. Referenced by __write_formatted_timeT(), ConvertTimeString(), get_ldate(), GetStartSpoolDate(), GetUTCOffset(), rdp_send_logon_info(), stime_arg1(), test_mktime(), UnDate(), UnDosLine(), UnLslRLine(), and UnMDTMDate(). Definition at line 430 of file time.h. Definition at line 154 of file time.h. Definition at line 164 of file time.h. Definition at line 317 of file time.h. Definition at line 199 of file time.h. Referenced by _wctime(), _wctime_s(), ctime(), gmtime(), localtime(), localtime_s(), and time(). Definition at line 156 of file time.h. Referenced by _mkgmtime(), localtime_s(), and mktime().